Please merge this post to any ongoing discussion if it is appropriate. 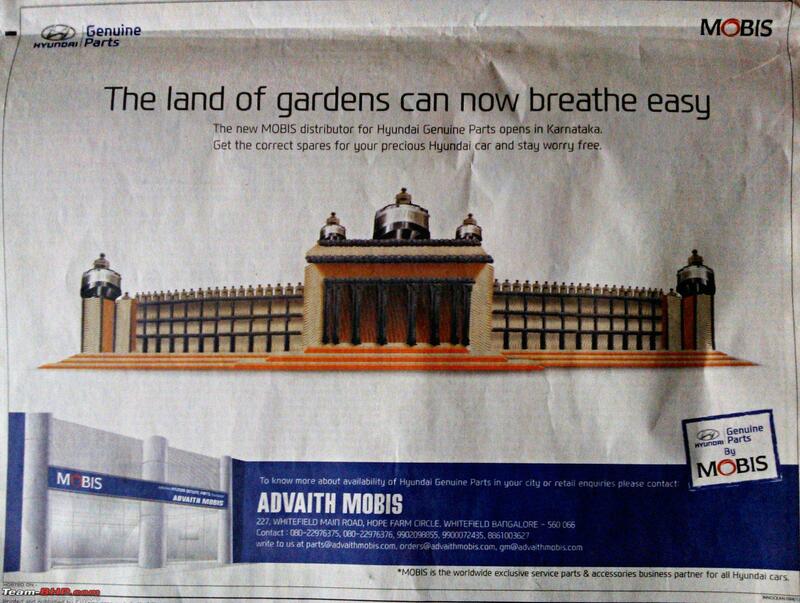 I saw an advertisement in Deccan Herald, dated 27/12/2013 by Hyundai. They have opened a new outlet selling Hyundai Genuine Parts for over the counter customers. This outlet is managed by Advaith Hyundai along with the official spare parts distributor Mobis. 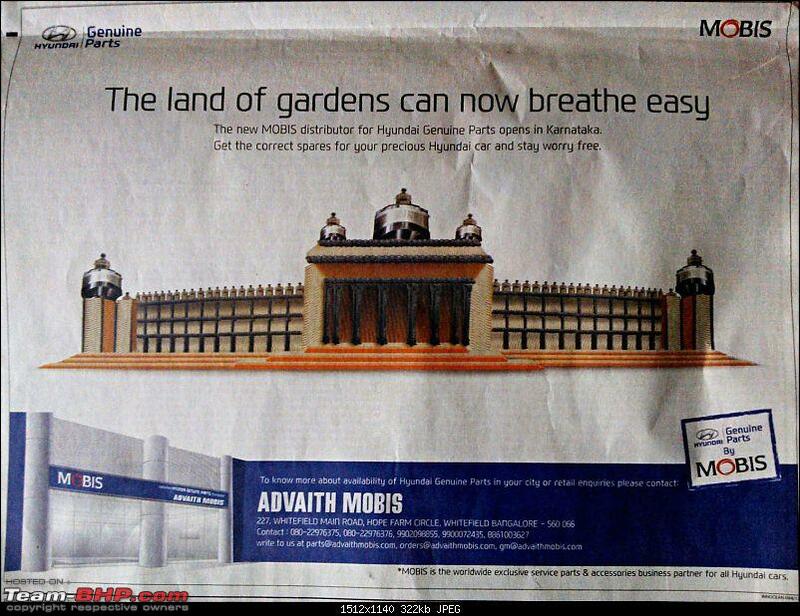 AFAIK, this is a fresh initiative and as per the advertisement this is the first dealer for entire Karnataka. Think this is a good news for those owners who did not want to visit the ASC for service or were not able to obtain spares OTC. Hope our members also benefit out of this initiative, especially the DIY fellows. Great to hear of this. Looks like the Competition Commission of India (CCI) referral is yielding results. This is a good news and would bring a lot of relief to people who pay exorbitant labour charges to get small issues addressed at company authorised workshops. They now have a choice of their own mechanic and spares. This is a welcome step, and could have been taken for the fear of the Competition commission which in all probability will direct all car manufacturers to start supplying spares in the open market. Last edited by mints21 : 27th December 2013 at 23:26. Great initiative. Now the FNGs can start repairing Hyundai cars using the genuine spares. Once they get the required spread of outlets across India, Hyundai would realise what they were doing incorrectly all these years. Unlike the ASCs, the local mechanic at an FNG will frankly applaud and criticise the cars based on the quality and people give a lot of weight to what they say. ASCs may not be happy since they might not be able to rob the customers heavily now but it could mean gaining the trust of owners. This move from Hyundai obviously is a big one for the Indian Auto industry. If this catches on, we can definitely see many more bigger firms coming into multi brand service centres. Kudos to all the knowledgeable customers who forced this move. I am sure Team BHP as well as CCI did play a big role. This move from Hyundai obviously is a big one for the Indian Auto industry. If this catches on, we can definitely see many more bigger firms coming into multi brand service centres. The moment VW & Skoda start OTC spares, you'll see a huge fraction of the risk-averse and affluent Indian public moving towards the German brands. All those who are worried about the pathetic service stories would have a fall back option in case things turn sour with the dealer. Fantastic, the news I had been waiting for a long time. Any update on similar store in Delhi/NCR region? Excellent initiative! Like zenren mentioned, I wish VW and Skoda follow suit. It would be a good idea for the VAG car owners to buy the spares from these authorized outlets and have them installed/replaced at the hands of skilled service technicians like those who are employed at Bosch Car Service and other private centers. Not generalizing here but usually their service tends to be quick, labour charges are cheaper and the overall experience is hassle-free compared to the VW/Skoda’s service centers. For petty services (for instance, a broken rear view mirror, bulb replacements etc.) the car has to be in their garage for a week to 10 days! As of now the three manufacturers selling parts in the retail market are MSIL, Hyundai, TATA as far as I know. However its not a long time before other manufacturers also follow the same. With the Germans, I think they would be the last to do so because they do depend a lot upon revenue from their expensive service network. Not that these three companies dont, but when we compare the costs, VW, skoda charge a lot for basic things like wheel alignment etc. They have a hold on customers as the spare parts are not easily available outside. If they make it available, the service centers will have just first time customers and people who still have the car warranty valid. No one else will visit them later. So unless it is mandatory for them to sell spare parts, they wont do so IMHO. A good move, no doubt. Simple things like changing oil, filters, wipers etc. are activities most owners can and want to do on their own so this will enable that. FNGs have always had a way to source genuine parts; only thing is, now everything will be quicker. When I had the clutch assembly of my Corsa replaced at an FNG in Bangalore, he could source the OEM part; just that, the whole process took 10 days. If they make it available, the service centers will have just first time customers and people who still have the car warranty valid. No one else will visit them later. So unless it is mandatory for them to sell spare parts, they wont do so IMHO. 2. Do something to improve the sales numbers - this would have to include measures like starting OTC spares if they want to see success. VW and Skoda are relying primarily on the Vento/Rapid sales. With Honda City getting a competent diesel engine, we'll definitely see some of those numbers eroded which might provoke some thinking in their management. If not, once SX4 replacement hits the dealerships, that would also eat away a good fraction of the remaining pie they enjoy and get them to do what is necessary to survive. BTW, if one of them starts OTC out of desperation, the other has to follow suit. Otherwise, some customers would start buying identical spares from the other brand thanks to the parts sharing and rebadging they do. Octavia is a good product but it happens to fall in a tricky segment considering the buyer dynamics and preference, and they cannot anticipate decent numbers even if it takes 100% of that segment. Of course, Elantra is not going to allow that either. If parts are not available via the OTC route, the word of FNG mechanic wont be trusted by many car owners who would be reluctant to take that chance unless they know the mechanic very well personally. It would only work in cases where they know the ASC folks personally. Last edited by zenren : 28th December 2013 at 14:22. Agreed. However, not many people really wonder if spare parts are available OTC or not before buying a car. Rather they do look at the quality of after sales. Hence, they can start selling parts OTC and at the same time cut down their service costs and labour costs to attract customers. Even if they sell parts, the price would be the same. Only labour charges will vary from ASC to Independent garage. Hence, if they reduce labour costs and advertise that in the same way, they wont be making loss even if the spare parts are sold. VW and Skoda going this way is too far ahead in my opinion. First, i think VW/Skoda's control of the dealer is quite low - and thats one reason why we hear of so many problems with their service. Second, any company which is looking to be number 1, 2 or 3 would be looking at "Whats good for the industry" and driving that to earn the long term commitment of the people. Hyundai has done it the hard way in spite of the market leader Maruti. I dont see that coming ever from VW or Skoda. Sorry to say - and i don't mean to offend any VW/Skoda owner here. The biggest worry should be for Tata/Mahindra here as their cars used to be cheap to service - with Hyundai also coming out with parts ultimately it would work to cheaper services as some people would start going to small mechanics. Going OTC is a double-edged sword since the local mechanics would get a much clearer picture of the cost of spare parts from each manufacturer and their durability. If one manufacturer is making more profits from parts than another, FNG will spot it easily when they buy the same part for two different cars in their garage. In case of ASC, they are usually not aware of a part to part price comparison but an FNG guy would be able to tell the cost difference of most of the common parts within 6 months of experience. If Hyundai parts cost more, they better have more durability. Else the premium they charge over Maruti cannot be justified.